Learn how to Create and Manage Remote Resources from the Settings Panel. Whenever you crate a remote resource it will be added to the Remote Source Manager in the Settings panel. Here you can manage the sources by adding new ones or editing and deleting old ones. You can find out more about remote uploaders by visiting our Uploaders Feature page. In your management panel go to ⚙️ Settings > External Uploads 🔽 > Remote Sources. Here you will see a list of your current Remote Sources. 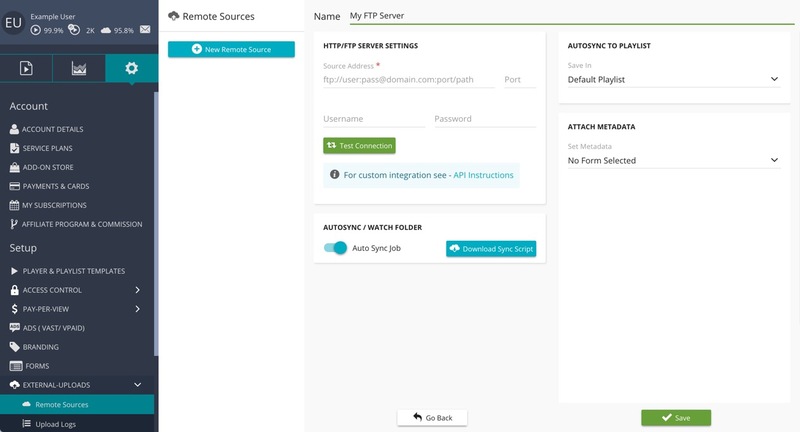 To create our new Remote Source you will need to click on the ➕Remote Source button. Name: Enter the name you wish to give to your Remote Source for identification purposes. Source Address: Enter the FTP or HTTP address for your remote server containing your media files. Port: Enter the port number you wish to establish a connection to. By default this is set to port 21. Username: Enter the FTP/HTTP Username if required. Password: Enter the FTP/HTTP Password if required. Test Connection Button: Click on the green Test Connection Button to test the entered details for your server. You can choose to automatically sync newly added media files from your remote source server by enabling the AutoSync feature. The remote source will be checked periodically when enabled. AutoSync to Playlist: Select which playlist you would like the newly synced media to be added to. Attach Metadata: Select if you which to add a Metadata Form for your synchronised media files. You set this to No Form, Default Form or a Custom Metadata form that you have created. When a Metadata Form has been selected the Form Fields will be shown below. If any information is entered at this stage of the Metadata Forms then all newly uploaded media will have the Form value added to them. Now we simply click on the green ✔ Save button to save your newly created Remote Source. To edit an existing Remote Source select it from the central Remote Sources panel. In the right hand ending panel make any your desired changes to the currently selected Remote Source. Save your changes by clicking on the green ✔ Save button. To delete any existing Remote Sources hover your mouse over one of your Remote Sources in the Central Sources Panel. You will see 2 buttons being displayed next to the Remote Source name. By clicking on the 🗑 Trashcan icon, you are able to delete the current Remote Source.